Hugh Glass (Leonardo DiCaprio) seeks vengeance. Alejandro González Iñarritu is the most versatile director of our time. After the highly complex Birdman, which reflects on media and show business in a self-referential way, he surprises the public with a movie which couldn’t be baser. It reminds me of the famous quote by Auguste Rodin, ‘I choose a block of marble and chop off whatever I don’t need.’ Because the director has gotten rid of anything in the movie that could be considered superfluous. But let’s switch to the story about a group of fur hunters in the 19th century North-Western American woods. After an attack by Indians with terrible losses, Hugh Glass (Leonardo DiCaprio) and his half-blood son are among the lucky survivors led by John Fitzgerald (Tom Hardy), who wants to take the furs they could save to the next fort to get the promised money. 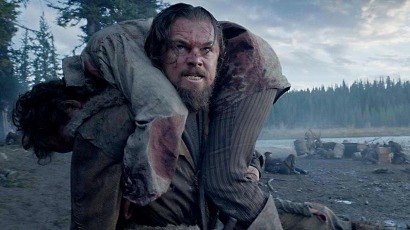 On the way, Hugh Glass is attacked by a grizzly and terribly hurt. The others carry him with them but the delay becomes too much for John Fitzgerald and he decides to suffocate him. Glass’s son catches him in the act and Fitzgerald stabs him. Helplessly, Glass Is forced to watch his son’s murder before he is left to die in an earth hole. In a remarkable struggle for life Glass regains his full strength and traces Fitzgerald to take revenge on him in a furious showdown. First of all, this time Leonardo DiCaprio has definitely deserved the Oscar for his absolutely convincing and astonishing performance. The audience cannot be left untouched by the horrible sufferance he conveys expressively and immediately on the screen. The blatant existentialism of his performance fits the concept of the movie brilliantly. Tom Hardy as his opponent is convincing too, but less committed to his role in my opinion. I consider The Revenant an archaic movie because it is about some of the oldest human themes: survival and revenge. The frequently-shown symbol of the spiral is not only aesthetic but also a reference to the eternal recurrence and fatefulness of life. Still revenge remains something humans cannot bring about but have to leave to God. The sociocritical aspect of the movie remains somewhat underdeveloped even though Glass has a half-blood son and speaks the Indian idiom of a tribe you must not expect another Dances With Wolves. Colonists and natives are not primarily separated by culture but both part of the ruthless nature. Even though the whites call natives ‘savages’ and lynch them, they do not behave differently. What really excited me about this movie is the similarity to Jack London’s famous novel The Seawolf. The book is also about an existentialist fight for survival depicting the cruelty of an indifferent nature, although London leaves out God and mythology. I recommend this movie to all people who are not afraid of life in all its brutality and hardship.